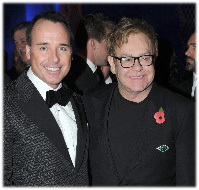 Elton John has revealed that he is working with Billy Elliot writer Lee Hall on a biopic of his “surreal” life. The singer told Chris Evans on BBC Radio 2 that his life story would be told in a Moulin Rouge-style musical fantasy: “it’s not going to be your normal, run-of-the-mill film”, Elton said. He told listeners that a “great script” had already been written by Hall. The flamboyant gay icon has certainly had an extraordinary life, so far; from drug-fueled glam rock, to selling 250 million records, to recently adopting a baby boy with his partner, David Furnish. John’s most recent project is the animated film Gnomeo and Juliet, in which he performs several songs. “Now I have balance in my life”, he told the radio presenter, “I have a wonderful partner in David, I have wonderful friends. I can remember things”.